In 2014, 59 new halo globulars were announced from the Pan-Andromeda Archaeological Survey (PAndAS). Two of these are PAndAS-53 and PAndAS-54, a globular pair separated by only 2 arc minutes! Furthermore, this outer halo pair is located a full 7° ESE from the center of M31 and quite far from the visible disc. I observed both of these last September using my 24-inch. 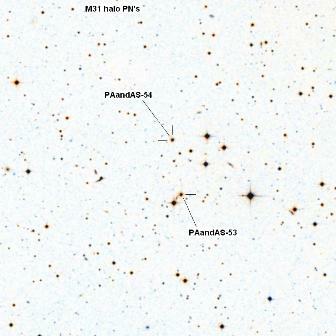 PAndAS-53 was easily seen (mag 15.5) as a faint, extremely small but non-stellar glow, perhaps 4" diameter. Occasionally a faint stellar nucleus (more obvious with direct vision) was visible. PAndAS-53 is close northwest [25"] of a 12th magnitude star and a distinctive square or diamond asterism [sides 0.8'-0.9'] is close NW. PAndAS-54 was about a half-magnitude fainter (V~16.0), and just appeared as a very faint "soft" quasi-stellar object, perhaps 3"-4" diameter with a low even surface brightness (no hint of a stellar nucleus). Here are the positions if anyone is interested in tracking these down. These two distant objects are part of an article I wrote on Local Group GCs in the November issue of Sky & Tel ("In Search of Extragalactic Globulars"). It covers GCs in a number of galaxies from the LMC out to the edge of the Local Group (WLM Dwarf). I also observed these last September when Steve brought them to my attention. Conditions were poor for the night of my observation, with very poor seeing, at a Bortle 3 low altitude site, 21.15 MPSAS. In such seeing conditions it was hard to distinguish very small dim DSO's from equally dim stars. PAndAS-53 found immediately at 357x with more separation than anticipated from nearby 11.9 mag star, and it could be held in view constantly. While it didn't look quite stellar overall, it did sport a stellar core at times surrounded by the glow--this was my best indication that it was truly non-stellar. With the very poor seeing I was uncertain whether the fuzzy glow around was completely real or an illusion of the seeing. PAndAS-54 was more challenging. While it was seen often enough at 357x its form was even less clear because of its averted vision nature. I could not hold it constantly. I wasn't quite seeing a stellar core with it, which supports its non-stellar character. By comparison, threshold stars would flash stellar at times. 500x made it more difficult because of the unsteady seeing. One of the best things about this pair is that they are visible in the same high power field. On a prior night at altitude I observed the globular Martin-GC1 which Steve had also made me aware of (and is also described in Steve's S&T article.) Conditions were better that night and at 357x I noted it as a "larger than expected fuzzy glow" indicating that while it was small, it was clearly non-stellar compared to the 16.7 and 17 mag stars seen nearby. In Wikisky this globular can be found as PGC 2017209. There is a nice galaxy about 2/3 of a degree south of Martin-GC1, NGC 266, near my initial star hop. This galaxy at first appeared at as a good sized ~E/W elongated tilted spiral because of its bright main bar. However, it is actually near face on, and observing longer revealed the fainter glow encircling it, although I was unable to see the distinctive structure of the thin kinked/angular arms surrounding it. Edited by Redbetter, 06 October 2018 - 11:16 PM. While researching potential M31 globulars I ran across this paper which mentions Martin-GC1 as well as a few other confirmed, very remote, M31 Globs: https://arxiv.org/pdf/0705.4037.pdf This past Friday, under very good seeing, I was able to see 5 of the 6 mentioned. (see page 6 of the paper) Mackey-GC1, B516, B517, B518 and Martin-GC1. B519, at 17.3 mag, was not seen. On the same night we, Larry Mitchell and I, were also able to see the 16th mag globular cluster in WLM-1. http://iopscience.io...1086/500300/pdf Unlike the globulars in M31 we could not see this one as anything other then stellar. 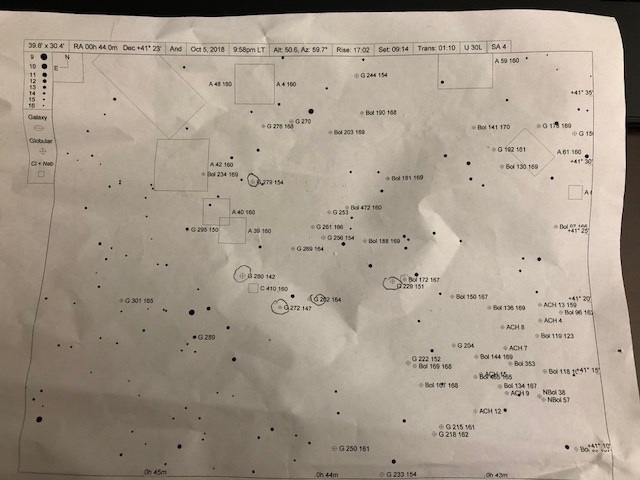 I have added PAndAS-53/54 to my observing plan for Okie-Tex with field images gleaned from WikiSky for guidance along with several M31 globulars from the S&T article and available papers. Some I have observed and documented some seen but undocumented. Others will be new sightings. I'm also hoping to detect the C311/312/313 open cluster complex in M31, though that may require larger aperture than mine and maybe better skills. Plus the weather seems to be limiting the useful nights more and more as we get closer. Interesting. Any good maps online for finding these globs? I'd love to have a go at some of them soon. Would any of them be within reach with a 20" at about 200x in good seeing and ~21.8 MPSAS? Your 20" should do just fine on quite a few of the globs. A neat observing experience is that at low power the globs appear stellar for the most part. As you increase magnification the surrounding stars remain stellar but the globs start to become mushy. G279 is a very good example of this. No kidding, its really cool. I do my finding with a 35 Panoptic, ~90x, and confirmation with an 8mm Delos, ~400x. When the seeing is good I can bump up to 700x and see the shape of the globular. The other night under very good conditions I was working the area around G279. As I was starhopping to Bol172 the core of M31 entered my eyepiece. Way cool. For some reason, perhaps someone here can explain it, the light of the M31 doesn't seem to affect the detectability of the globs in the way that interior of M57 makes the detection of the central * much more difficult then it should be. My record so far in my 25" is Bol172 which is listed at mag 16.7. It was averted vision but I could definitely see it was non-stellar. It was in the same high x field as G229 which is an easy target at mag 15.1. Here is a crumpled chart from the other night, shortened due to clouds rolling in. The ones circled I could positively see. The core of M31 is just to the lower right of the chart. Edited by Keith Rivich, 08 October 2018 - 09:45 PM. Thanks! That's a lot of good information to get started. I was right then in suspecting a few pinpoints to be globulars instead of stars, even at around 200x. I manipulate WikiSky imagery to get nearfield images to take to the field. With Nexus DSC's that's all I generally need. Your scope's bigger than mine and your skies are darker. You should have no problems. Of course now I see I've labeled these two globulars as PN's on my observing aid as previous halo objects I've seen have been MW PN's and I'm terribly habitual. Edited by havasman, 09 October 2018 - 05:08 AM. For dim objects that aren't standard catalog names, I usually grab the RA and Dec from the reference, then find the point in Wikisky and see if there is a visual component displayed. I usually check the Uranometria page to see what is nearby and plan a hop. I pencil in the object in Uranometria most of the time and either make a quick deep star field reference sketch (relative to my final hop point in Uranometria) to take in the field, or print a chart from Stellarium etc. marking the object location and take that with me. I haven't done most of the more stellar globs in Andromeda. I have done many down into the 16's in other galaxies in the Local Group. A bit more background on Martin-GC1. The discovery was announced in 2006: "Discovery and analysis of three faint dwarf galaxies and a globular cluster in the outer halo of the Andromeda galaxy". This halo globular actually resides in Pisces, 8.6° south of M31! Abstract: "We present the discovery of three faint dwarf galaxies and a globular cluster in the halo of the Andromeda galaxy (M31), found in our MegaCam survey that spans the southern quadrant of M31, from a projected distance of ~50 to ~150 kpc. Though the survey covers 57 deg2, the four satellites lie within 2° of one another. From the tip of the red giant branch (RGB), we estimate that the globular cluster lies at a distance of 631 +/- 58 kpc from the Milky Way and along with a ~100 kpc projected distance from M31 we derive a total distance of 175 +/- 55 kpc from its host, making it the farthest M31 globular cluster known." A 2009 paper study, "The Outer Halo Globular Clusters of M31" derived a distance from M31 of 118 kpc or ~385,000 l.y., which matches the most distant known globular in the Milky Way (AM 1, located in Horologium). But another 2009 study "Deep Gemini/GMOS imaging of an extremely isolated globular cluster in the Local Group" came up with a radius from M31 of 650,000 light years! "We measure the distance to MGC1 and find that it lies ~160 kpc in front of M31 with a distance modulus 23.95 ± 0.06. Combined with its large projected separation of R(p) = 117 kpc from M31, this implies a deprojected radius of R(gc)= 200 ± 20 kpc, rendering it the most isolated known globular cluster in the Local Group by some considerable margin." MEADE ETX-LS 6""et 8" LA VÉRITÉ ET SEULEMENT LA VÉRITÉ.